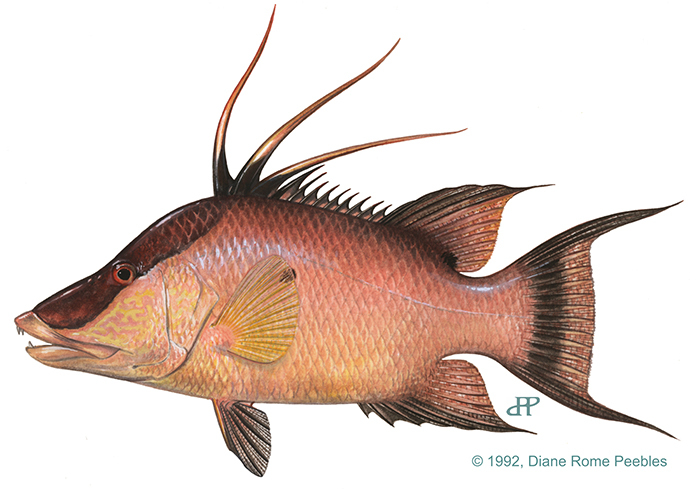 Stock assessments indicate hogfish may be experiencing overfishing in the Gulf of Mexico. As such, biological and demographic information for the species is critical. Feeding strategies and trophodynamics for hogfish are currently being studied by biologists in the Fish Feeding Ecology lab within the Fisheries-Independent Monitoring group. When feeding, hogfish crush organisms with specialized pharyngeal plates in the throats making it very difficult to determine their preferred prey species. A new subsampling procedure has been effective and efficient in describing the diets of hogfish collected from multiple surveys across a wide range of sizes throughout the eastern Gulf of Mexico. Results indicate that hogfish experience changes in diet with increased size/age and movement offshore. Adults were found to eat more molluscs (shells), crabs and commercial shrimp compared to smaller, nearshore fish whose diet was primarily hermit crabs, small crustaceans and non-commercial shrimp. This examination of hogfish diets represents a critical first step in understanding their unique ecology and trophic interactions, which in turn provides valuable context and laboratory methodologies for current and emerging ecosystem research in the Gulf of Mexico.